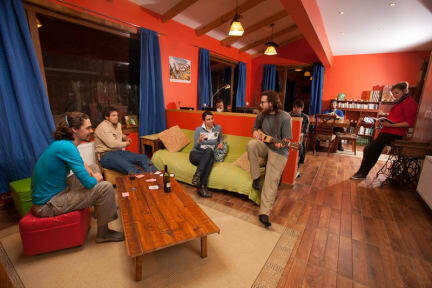 The Singing Lamb Backpackers i Puerto Natales, Chile : Boka nu! Really nice hostel. One of the best in our travels in South America. Good breakfast but pretty dry bread. Comfy beds, towels included. Clean. Good kitchen with good utensils. Good social areas. They’ve got 3 computers that you can use and they also helped us print some tickets, very helpful staff! Great hostel located a couple of blocks from the Main Street. Very helpful staff and amazing facilities, especially the kitchen. Beds were perhaps the best I've encountered in a hostel. Needs a couple more bathrooms considering the amount of people staying there. 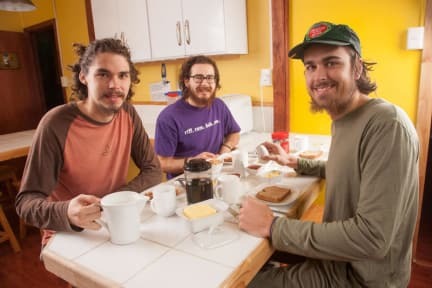 We only stayed for one night before giving to Torres del Paine (like a lot of people). So I can't give a full review - but the overall feel of the place was great! Would recommend!